We were given it last year, shortly after we moved into our new house. I did not note when it flowered but I don’t think it was until sometime in July. I harvested the seeds and got them off to an early start and this morning was the first time the flower has been fully open. 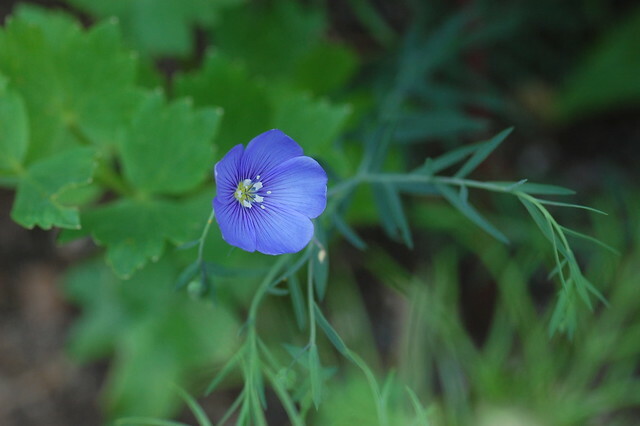 I love blue flax! It produces so many flowers for such a long time period. Since yours is just getting started, you’ll have a long time left to enjoy it while it keeps getting better and better. 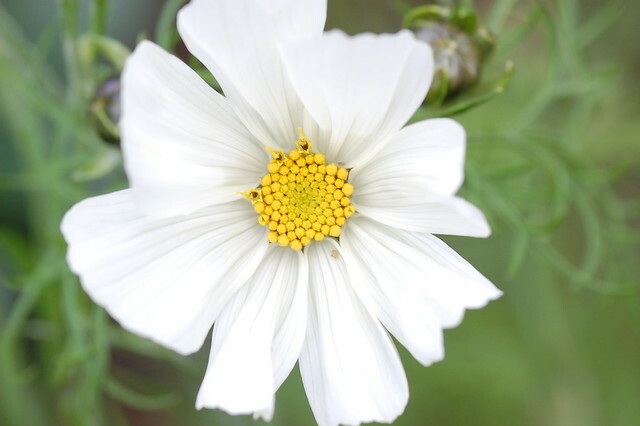 Hi i just learned there is a white cosmos, what we only have here are yellows, orange and pinks. I wonder if it is also very much loved by butterflies like the yellows and orange. That Linum is so unique, but we dont have it here. Happy Bloom Day, thanks. The Limum bloomed in my garden 6 weeks ago. Very nice dependable plant. Mine are somewhat shaded out also. Both are beautiful…Cosmos is probably my favorite annual of all time…there is something so pure and lovely about them! There is more blooming – these were the two which happened to open for the first time yesterday. June is a lovely floral month in the garden – my only worry is that nothing else might live up to it!